My primary research interest is commutative and computational algebra, with related interests in homological algebra and algebraic geometry.In essence, these fields find their roots in the study of algebraic equations in relation to the geometry of their solutions. Such a line of investigation goes back at least to Descartes and the idea of coordinatizing the plane. Nowadays, though, commutative algebra and algebraic geometry study the solutions of those equations by forming an algebraic object, called a ring, which consists of the `generic' solutions. The algebraic properties of these generic solutions then give insight into the geometric and algebraic nature of the equations. 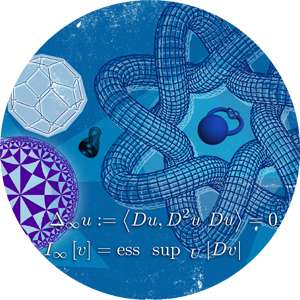 The methods in use are no longer from algebra alone, but also from analysis and topology. Conversely, they have been extensively used in those fields as well, and have proven useful in other fields as diverse as physics, theoretical computer science, cryptography, coding theory and robotics. Sally modules of m-primary ideals in local rings, Comm. Algebra 37 (2009), 4503-4015. Monomial and Toric ideals associated to Ferrers graphs (with U. Nagel), Trans. Amer. Math. Soc. 361 (2009), 1371-1395. Specializations of Ferrers ideals (with U. Nagel), J. Algebraic Comb. 28 (2008), 425-437. Multiplicity of the special fiber ring of blowups (with C. Polini and W.V. Vasconcelos), Math. Proc. Camb. Phil. Soc. 140 (2006), 207-219. Core and residual intersections of ideals (with C. Polini and B. Ulrich), Trans. Amer. Math. Soc. 354 (2002), 2579-2594. The structure of the core of ideals (with C. Polini and B. Ulrich), Math. Ann. 321 (2001), 89-105. A class of strongly Cohen-Macaulay ideals (with C. Polini), Bull. London Math. Soc. 33 (2001), 662-668. A generalized Dedekind-Mertens lemma and its converse (with W. Heinzer and C. Huneke), Trans. Amer. Math. Soc. 350 (1998), 5095-5109. On the integral closure of ideals (with C. Huneke and W.V. Vasconcelos), manuscripta math. 95 (1998), 331-347. Links of prime ideals and their Rees Algebra (with C. Polini), J. Algebra 178 (1995), 224-238. Links of prime ideals (with C. Polini and W.V. Vasconcelos), Math. Proc. Camb. Phil. Soc. 115 (1994), 431-436. Commutative Algebra and its Connections to Geometry (A. Corso and C. Polini, Eds. ), Contemp. Math. 555, Amer. Math. Soc., Providence, RI, 2011. Algebra, Geometry and Their Interactions (A. Corso, J. Migliore and C. Polini, Eds. ), Contemp. Math. 448, Amer. Math. Soc., Providence, RI, 2007. Commutative Algebra: Geometric, Homological Combinatorial and Computational Aspects (A. Corso, P. Gimenez, M. Vaz Pinto and S. Zarzuela, Eds. ), Lecture Notes in Pure and Applied Mathematics 244, Chapman Hall/CRC, Boca Roton, 2006.